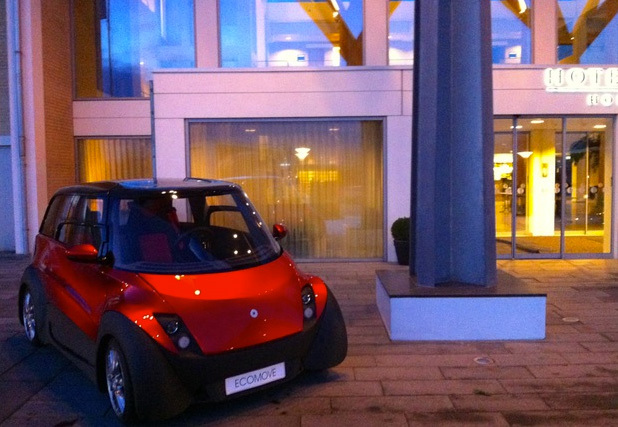 The Danish company ECOmove is now ready with the third prototype of their electric vehicle QBEAK, thus taking a step closer towards the realisation of a lightweight concept for the EV industry. QBEAK III demonstrates a series of ground-breaking lightweight technologies, which, in addition to reducing the weight of the car, increases its range and makes it more affordable to drive an EV. – The new QBEAK is a much more finished version than number two. For example, the car now has charging structure and instrumentation, and its technologies are so far advanced that we are ready to mature them for production, says Mogens Løkke, CEO at ECOmove. ECOmove originally aimed at a launch of the EV in 2012. However, along the way, challenges appeared, which – along with the complexity of developing the most environmentally-, energy- and city-friendly car in the world without compromising the safety and design – have delayed the original time schedule. – One of the major challenges has been long lead times, which has cost precious time. But we stuck to our concept and criteria for both the development and the quality. We are now very pleased to present an even more complete version of QBEAK, says Mogens Løkke. – By entering into partnerships with manufacturers who have well-established supplier networks, we are convinced that the first QBEAK will be ready to leave the factory in 2014, says Mogens Løkke. Please contact CEO Mogens Løkke, mail: mogens@ecomove.dk, telephone: +45 5361 0240.